Today in a pre-recorded statement from Nintendo's Kyoto headquarters, Nintendo president Satoru Iwata introduced Nintendo's new home console the Wii U and how the Wii U GamePad, the controller's official name, is different. 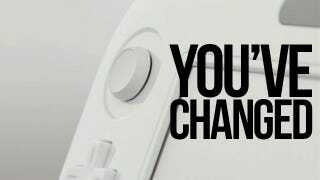 First, Iwata revealed that Wii U GamePad's name harkens back to the Nintendo Entertainment System's controller, the NES gamepad. Regarding the changes, Iwata stated that the buttons were moved to make the controller more comfortable. The controller's handgrips were also changed to make the controller easier to hold. The sliders are now thumbsticks that can be pushed down, and the controller has a NFC reader/writer than can read cards or figures when they are placed on it. The Wii U can also be a TV remote controller with a new TV Remote Control button. Unlike the Wii, which can only turn the Wii on or off, the Wii U Gamepad can turn off the console and then turn itself into a TV remote controller. Last month, an image surfaced of a tweaked Wii U GamePad that showed off the redesigned analog thumbsticks. That image did not show the labeled TV Remote, but it did show the button. Nintendo showed that feature for the first time today.